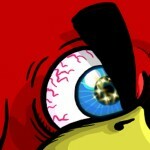 Here is our walkthrough strategy for Angry Birds Rio Treasure Hunt Level 36. I think I ran into a double count glitch on this level, but I’m not sure as I have never seen one before. But I remember reading about one recently on another level in Rio. My screen shows a high score of 189850. But I made a screen capture right after Matilda did her damage and it shows a score of 149850. When I took the screen shot counting was complete or nearly complete. So I think my true score is 149850 + 20k bonus. Anyway thats what I have recorded. So now I have a dilema about what to do if I score more that 169k in the future. Its unlikely I will run into the double count, so my high score will show 189850. I guess I will have to remember to take a screen shot as soon as the level recycles. Anybody got another suggestion? Here is the screen shot I referred above for future reference. Very interesting, that it might be a double counted bonus bird glitch. Could you tell me if you somehow paused the game right before the bonus birds were counted, and then unpaused it to wait for the score tally screen to appear? Used first bird like video. Second low over debris left from first bird. Drop bomb over best opening in debris. Bird goes up hits top tower, tower falls, sets off TNT. Right tower falls right. With luck, points go up.